Kalajoki is located in Northern Ostrobothnia in Finland, on the shore of the Bothnian Bay. Kalajoki is easily accessible by road, and there are also train stations and airports nearby. Kalajoki is situated in an easily accessible location at the intersection of highways 8 and 27. You can easily travel to Kalajoki by car, but the buses of several passenger companies also stop in Kalajoki. The nearest train stations are located in Ylivieska (about 40 km) and Kokkola (about 70 km). You can find the train timetables and ticket prices on the VR website. Both stations have bus connections to Kalajoki. 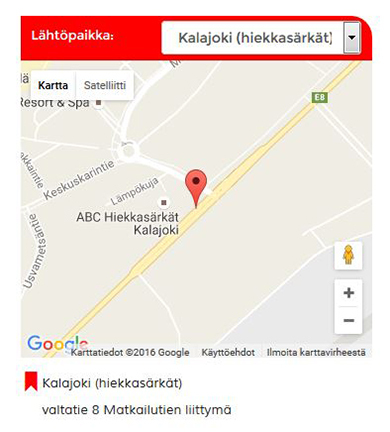 Contact Matkahuolto or visit its website to find out about bus timetables. 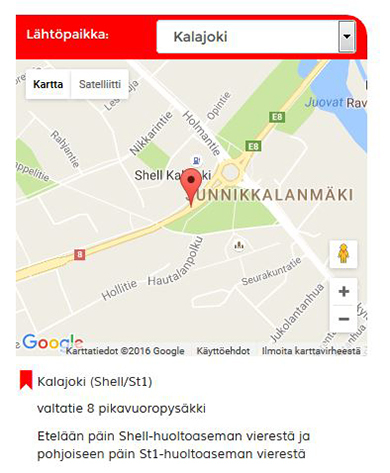 You can fly to within easy driving distance of Kalajoki. 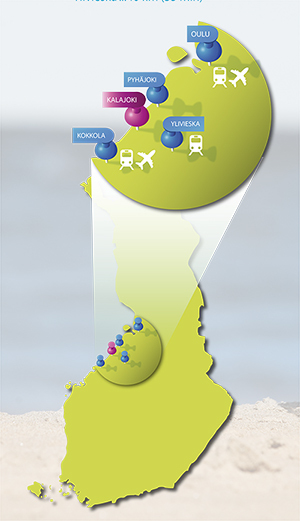 The nearest large airports are the Kokkola-Pietarsaari Airport (about 100 km) and Oulu Airport (130 km). Scandiarent operates in Kalajoki. The car rental rents private cars and other vehicles. Bothnian Coast Road, which gained the national status of a tourist route in 2010, also travels through Kalajoki. The coastal road has connected the towns at the river mouths along the West Coast since the Middle Ages. In the Late Middle Ages, the coastal road along the West Coast acted as a route and a post road, circling around the Gulf of Bothnia to the southern parts of Sweden. The current marked Coast Road stretches from Vehmaa in Southwest Finland to Tornio in Northern Finland. The tourist route travelling along the coastline offers an alternative to fast and straight main roads. There are several environments and attractions well worth stopping for along the coastal road and in its vicinity. Interesting attractions along the coastal road in Kalajoki include Hiekkasärkät and Plassi, the old town of Kalajoki.